SERIES PTR are operationally programmable power modules that can be programmed to any level within their rated range and fully loaded at any output setting. These power supplies offer ultra low noise and ultra low ripple at the output. SERIES PTR provides separate channels for voltage and current stabilization, with automatic crossover, and an optional overvoltage crowbar that mounts within the module. Six PTR Models are available. PTR models are equipped with a built-in current sensing and control channel for precision current stabilization, with automatic crossover from and to the voltage stabilization mode. A built-in trimmer adjusts current over the range 2% Io to 100% Io max. Current may be externally controlled (programmed) by a remote potentiometer or by a small d-c voltage. The potentiometer functions as part of a divider across the internal reference delivering 0-0.5V to the current control terminal. This voltage (with respect to plus output) can be derived from a separate programming source (as, for example, a Kepco SN or SNR programmer). For a wider current control range, the voltage channel of the PTR may be connected so as to sample the drop across an external current-sensing resistor in the plus output lead. An external rheostat with careful zeroing of the built-in zeroing potentiometer will control current from 1µA to 100% Io. (Note: the range of currents controlled by any single current-sensing resistor should be limited to a 50:1 ratio). Operationally, the PTRs are 3-terminal, unipolar, inverting d-c amplifiers in which the plus output sensing terminal serves as common between the output and an external programming signal. For isolated digital control, see Kepco SN and SNR Series. 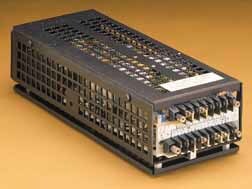 Rack mounting of Series PTR is accommodated by RA 33-3, RA 34-4 and RA 35-1 rack adapters. Series PTR is also suitable for DIN rail mounting.